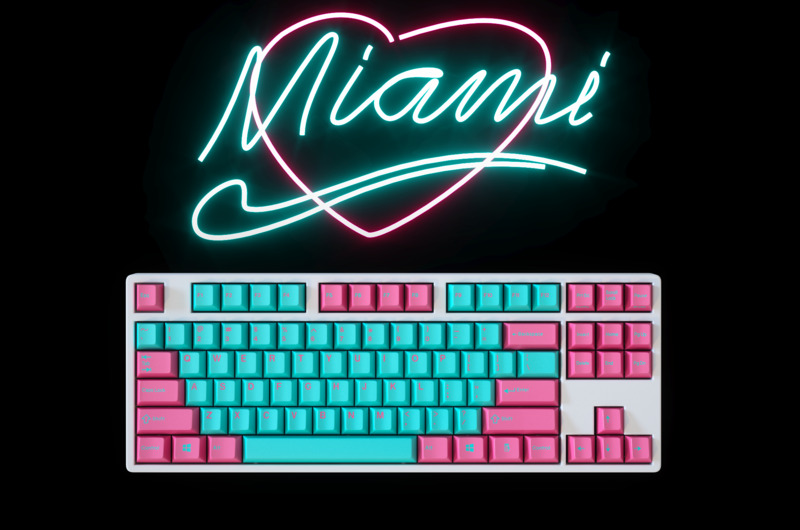 Miami is one of the original custom keycap sets in the community. It was first run by [CTRL]ALT in 2013 and has since spawned many variants. We are delighted to introduce Miami in a new profile, while taking advantage of the striking colors offered by GMK to fulfill our Miami dreams. I love and hate you sherry! I'm new around here ... please don't notice. 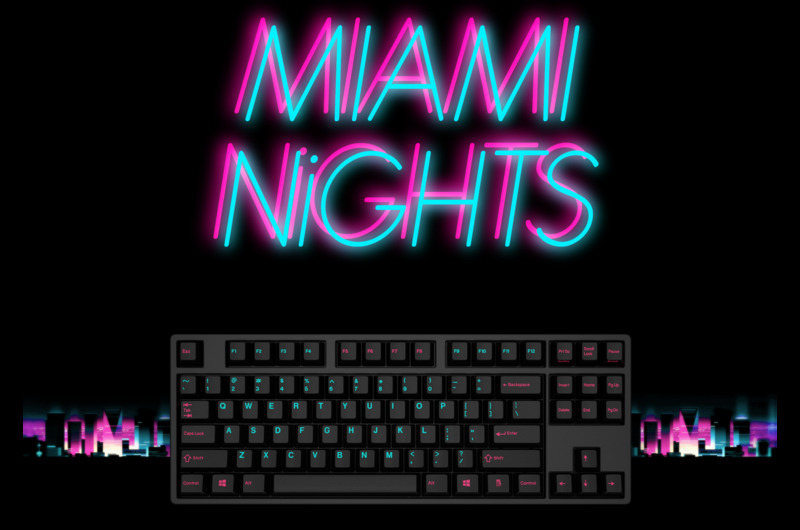 Is the base color of Miami Nights Black (CR)? Haha, I definitely understand. 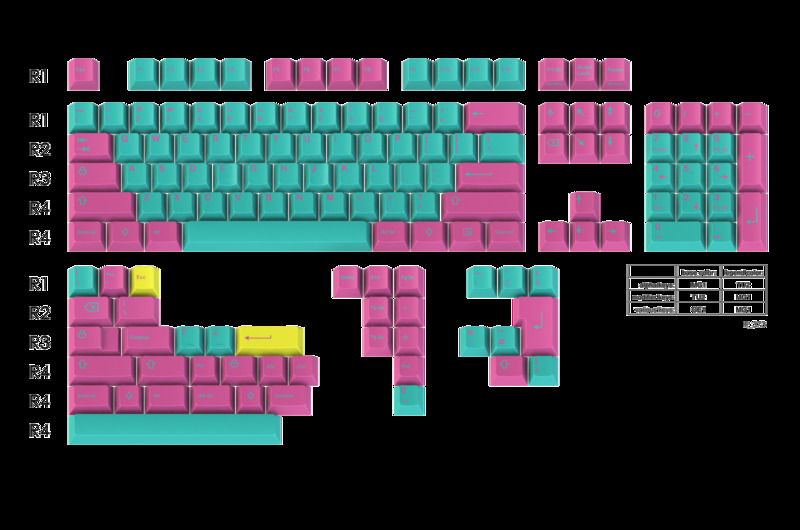 We already ran the Miami Dolch set, and we planned to run a Sky Nights but I thought this would be one of the best sets ever. Definitely getting in on this- especially as it solves the problem with Miami Dolch in that I have to get sets to cover all boards I'd want to put it on, rather than one size fits many. Why, whyyyyyyy!? My poor wallet! Any chance of going with the Windows logo instead of diamonds? I'm not a fan of diamonds at all. To me, they make any keyset look cheap or like a knock-off. It'll be a pass for me if it's diamonds. Or at least replace with "Code" or "CODE" like GMK Cyan. What's the deal with the inconsistent legends? Terry, the picture by autobot is the correct picture. Sorry about the complications. Whilst I won't be taking part, I agree with autobot. It looks fairly out of place when Control and Alt are letters. It makes sense if it's uniform (like GMK Penumbra, where the whole bottom row was caps), but mixing and matching feels a bit less fitting. Thanks for your opinion! I'll definitely take this into consideration and might be adjusting it to the CODE Key. The reason why I chose diamonds in the first place was to use as little text as possible for the whole keyset. By that logic, the Windows key would be a better fit, no? Look at page up, page down, home, end, etc. You're using icon mods for the "standard" keys and text legends for 75% and 1800. If that's really correct, it's a deal breaker for me. Thanks for the information. I'll be e-mailing GMK. Cool, keep us updated. I'm definitely interested in joining but I use 1800s, so I don't want it to look jakey. Seems the best option would be text mods & windows keys, just like in your non-GMK generated renders. I think that'd work best. Having text means more of the contrasting color against the keycap color. I would prefer text as well but I could live with either assuming it's uniform. I can't live with an icon pgup next to a text pgdn. just to go against the grain of last few posters. I'm totally in for icon mods. Diamonds look the best! There are too few keysets with them. These are Miami-themed keysets after all. Diamonds bring the bling! Icon mods over here as well, please. It was staring us all right in the face - good spot! I just want that purple sky fugu. It looks like it matches perfectly with GMK HyperFuse! Maybe forego the 3 ISO number keys, and pad print the ISO legends on the ANSI keys, then bring back 2 x 1.25u Windows keys? Miami Nights is good to go! I'll continuously work with GMK to bring this set with all the correct keys. We'll do textless but not on the keys above the arrow keys (unless I can get the 1800/75 keys to be textless as well). will the final key legends be determined before the order period ends? As I recall, the original Miami had flamingos and palm trees. That's the only way to go! Welcome to geekhack -- where we like to type -- but don't care so much about reading. We are going with all textless for modifiers and text for above the arrow keys and most likely CODE keys on the bottom. How much would shipping to Austria, Vienna 1090 be? And can I cover a AMJ40 from Aliexpress with that set? Too bad for the diamonds. They were spot on, in my opinion. Will that be textless even for the bottom row (except Code obviously)? Control, Code, Alt, but definitely a novelty key in replacement for an additional windows key instead of Diamond. We'll do something more in line with the theme. Honeywell had both CODE and Windows, and we'll definitely follow along. Hey sherryton, will you get updated GMK renders to reflect all the changes made for both sets? Yes, I will have a chat with them tonight regarding the render. And a 6u spacebar, maybe as extra? 6u is a definite possibility. I'll also look into bars for you, bro This is definitely possible though. Suppose its time I finally grab myself a set. Thanks for considering my opinion, and for giving us a steady supply of fantastic sets. Just to confirm, Insert, Delete, Home, End, Page Up and Page Down will be all text? GMK was busy last night, so I have to give another call. I personally prefer to have them all textless, but it would only work if the 1800/75 support layout is also textless. If I cannot get them to be textless, then they'll all be text most likely. You actually gonna buy tho?